There are tastings, and then there are tastings. From the moment I walk in the door, I know this is going to be an unforgettable afternoon. 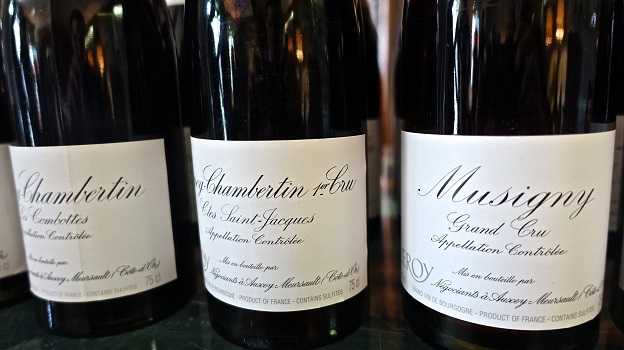 Twenty-two wines from Maison Leroy await, each of them representing a small piece of history belonging to one of the great families of Burgundy. The anticipation in the room is palpable. A fervent defender of terroir – the single most essential concept that defines Burgundy – and a staunch believer in principles of biodynamics, Lalou Bize-Leroy remains one of the most iconic figures in wine. 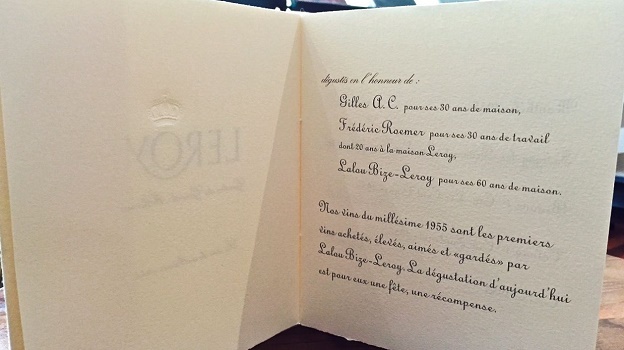 Born in 1932, the young Marcelle Leroy, known today to everyone as simply ‘Lalou,’ appeared destined for a life in wine after Henri Leroy placed a few drops of 1929 Musigny on the lips of his newborn baby daughter. The rest, as they say, is history. Well, truth be told, there is a bit more to it than that. Lalou joined her father in the family business in 1955 and later became co-manager of Domaine de la Romanée-Conti, where she was famously forced out in 1992. By then, Lalou had already laid the foundations for her own Domaine Leroy with the acquisitions of two estates; Charles Noellat in Vosne-Romanée and Philippe-Rémy in Gevrey-Chambertin. 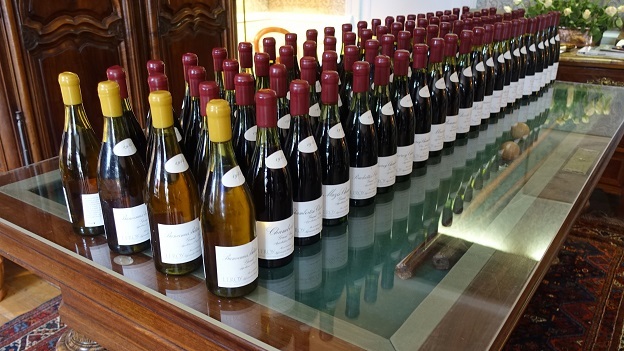 Today, the Domaine Leroy wines are among the most profound, rare and highly-coveted bottles in the world. Recent years appear to have brought about a rapprochement with DRC, where Lalou still owns 25% of the shares. I have had the privilege of visiting Domaine Leroy and Domaine d’Auvenay, Lalou’s estate on the hills just outside Meursault, a number of times over the last several years. 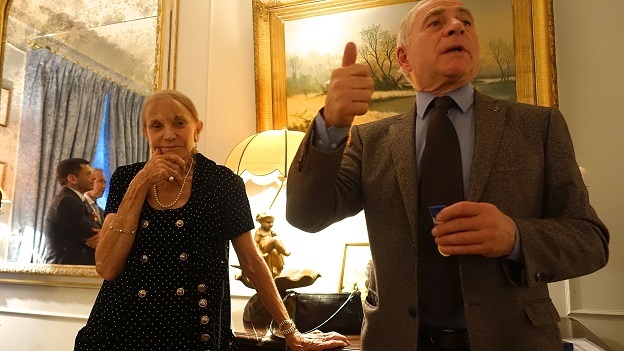 This April afternoon was special, as it marked several professional milestones for Lalou and her closest collaborators, most notably Lalou’s first vintage working alongside her father. 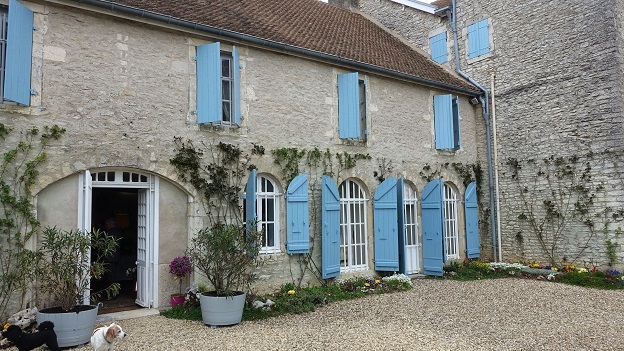 For the occasion, Lalou opened up her private home at d’Auvenay to a small group of Burgundy lovers. The country décor exudes warmth and a sense of classicism that reconciles elegance with rustic simplicity, while numerous photos and other personal mementos chronicle Lalou’s personal life as well as her extraordinary career. The guest list included a who’s who of the world of wine and wine writing, including Jancis Robinson, Michel Bettane, Thierry Desseauve, Bruce Sanderson, Matt Kramer, Neal Martin, Jeannie Cho Lee and Roberto Petronio, among others, plus long-time family friends Pierre Troisgros and Georges Duboeuf, most of whom made a special trip. I didn’t know every single person in the room, but I can say with confidence I have never seen so many wine writers in one place at the same time. I was seated with Matt Kramer, whom I had never met before despite being a huge fan, his charming wife Karen, Martine Saunier, who represented the Leroy wines for thirty years and Mr. Okazaki from Takashimaya, the long-time Leroy importer in Japan and a partner in Maison Leroy. The stories at our table were seemingly endless, but my favorite was the account of the Kramers showing up for their appointment at DRC in 1980 on bicycle. I can imagine arriving on bicycle, but it is the after that would have worried me more. The Kramers seem to have done just fine. Lalou worked the room with the energy of a twenty year-old. I don’t think she took a seat all night. Lalou opened a staggering three bottles of each wine for the small group of around thirty people. There was some attempt at moderation and pacing at the beginning of the tasting. Spit buckets made the rounds, but curiously, they filled up less as the evening wore on. By the end of the night all of the bottles were empty. I will confess that on a Saturday evening, after all the notes had been written, I did have a glass or two of some of my favorite wines, yet I had no issue at all waking up at an ungodly hour early the next day to take a flight back to Bordeaux, where the second half of the 2014s awaited. As for the wines, well, they were pretty special. 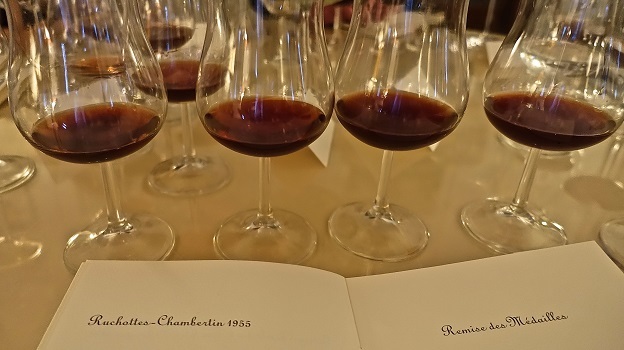 The 1955s are now fully mature, hardly a surprise given their age, but a few of the wines are also on the back end of their lives, so any bottles that come up at auction or that are purchased during one of the house’s re-releases need to be enjoyed sooner rather than later. 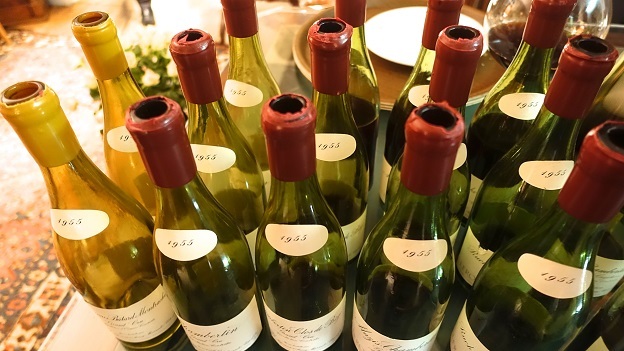 When I tasted a selection of 1964s with Lalou last year, she remarked that at the time, she and her father were guided by intuition more than anything else when it came to winemaking and élevage. There just wasn’t much knowledge on the more technical aspects, such as malolactic fermentation. Whatever the base of understanding was in 1964, it was obviously much less in 1955, the first vintage in which Lalou worked alongside her father. Courtiers brought samples and Lalou tasted the wines blind, without knowing their exact origins, and chose which barrels to purchase. There was always a middleman involved in any transaction. Of course, since then the number of estate bottlers has exploded and many domaines have gone on to become quite famous in their own right. It’s fascinating to contemplate; Where did the 1955 Musigny come from? What about the Mazis, or the Clos St.-Jacques? Towards the end of evening, François Patriat, a representative of the Cote d’Or in the French Senate, handed out the medals commemorating important anniversaries at Maison Leroy; 60 years of service for Lalou Bize-Leroy, 30 years for Gilles A.C., who handles logistics, and 20 years for Frédéric Roemer, who has been Lalou’s faithful right hand man for many years. I was especially touched by the story of Mr. A.C., whose father and grandfather had both held the same job at the maison. Needless to say, that kind of generational continuity is virtually unheard of these days. Over the years, the family’s full last name had been lost and at one point became abbreviated to ‘A.C.,’ a poignant reminder that these wines, no matter how rare, old or expensive, still represent the craftsmanship and toil of normal people with everyday, middle-class values.